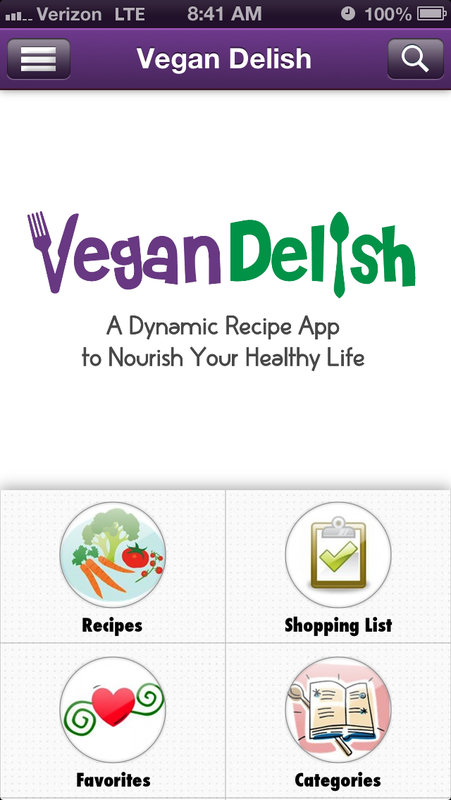 A few weeks ago, the absolutely lovely Carrie from Carrie on Vegan reached out to me and asked if I would like to review her app Vegan Delish. 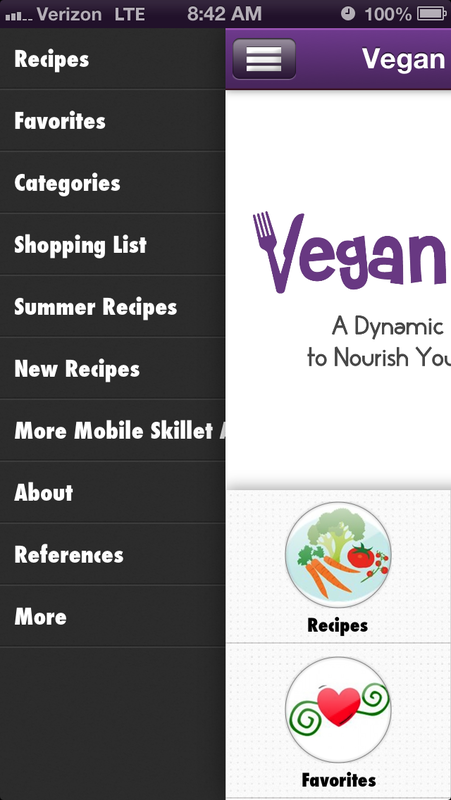 Vegan Delish is an amazing recipe app with mouthwatering whole food, plant based and many raw vegan recipes! They are all Dr. Furhman approved recipes, meaning low sodium, low/no oil, and low/no sugar -but don’t think for one second that these recipes lose out on flavor! the app is very easy to navigate, you can scan all the recipes or view them in categories, favorite the ones you want to make for easy access, make grocery lists for ingredients you need, and even email the recipes to yourself so that you can print them out!! I actually already had the app on my phone with half of the recipes favorited- so this was the PERFECT chance for me to get my cook on!! 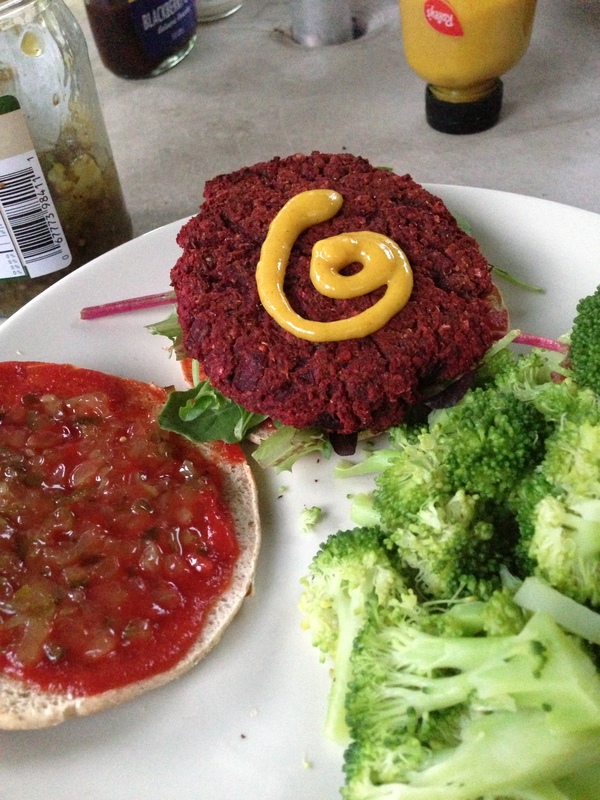 These even got a thumbs up from my stepdad (who, while slowly converting to our healthier vegan ways, still prefers more conventional flavors and is also beet-averse.) and my older sister (who just recently became vegan and is picky). So making these again!!! YUM! Whats that green stuff? Oh just broccoli slaw!! I’m serious! These muffins are made with whole oats, and garbanzo beans, have no oil, are sweetened completely with raisins and applesauce, and have 3 WHOLE CUPS of broccoli slaw! That means each muffin had almost half a serving of whole grains, fruit and veggies (you would seriously never know)! They weren’t overly sweet, which was great and they reminded me of cinnamon raisin bread (ah memories). 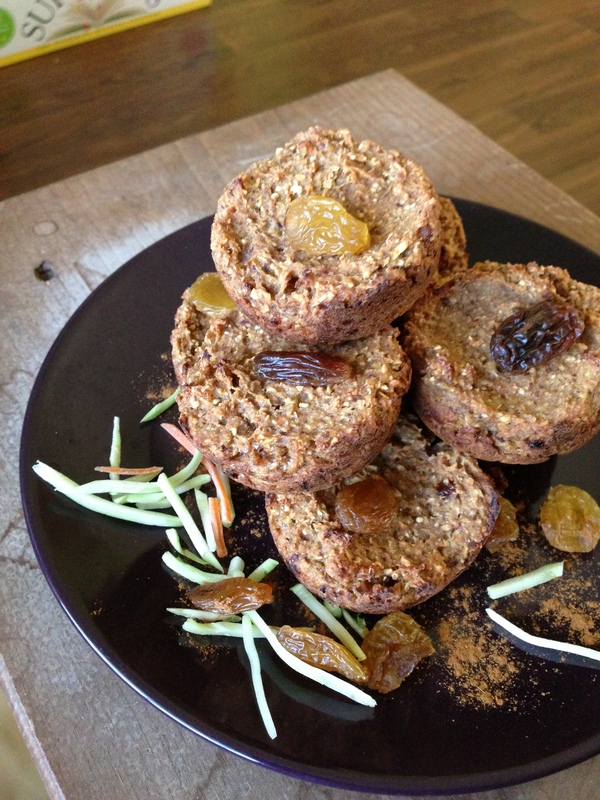 A perfect, hearty and healthy, fill you up muffin for a snack, or a couple for a meal! So good!!! 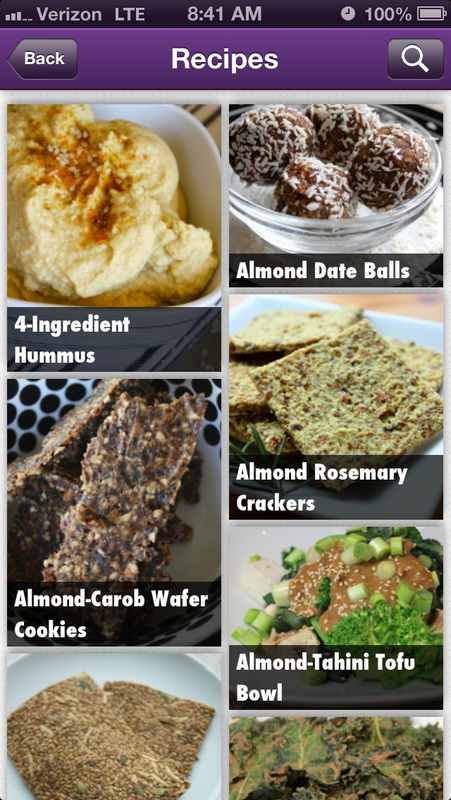 I really do adore this app -so far not a single recipe has disappointed and there are so many more I can’t wait to try too! Stuffed Sweet Potato skins, Herbed Dill Cashew Cheese, Chocolate Buckwheat Brittle, the list goes on! I have a feeling Banana Bread Oat Pancakes and Kabocha Squash Soup will be on the menu very shortly, with some No-Bake PB&J Pie or Vanilla Chai Chia Pudding for dessert! You can buy this awesome app for iPhones and iPads for only $2.99, which is an incredible deal considering that you are getting an ENTIRE COOKBOOK with new recipes constantly being added that you can take with you wherever you go! Whoo Hoo!!! Leave a comment telling me what your favorite app is! 1 entry for each task:) I’ll pick a winner on Saturday the 21st! 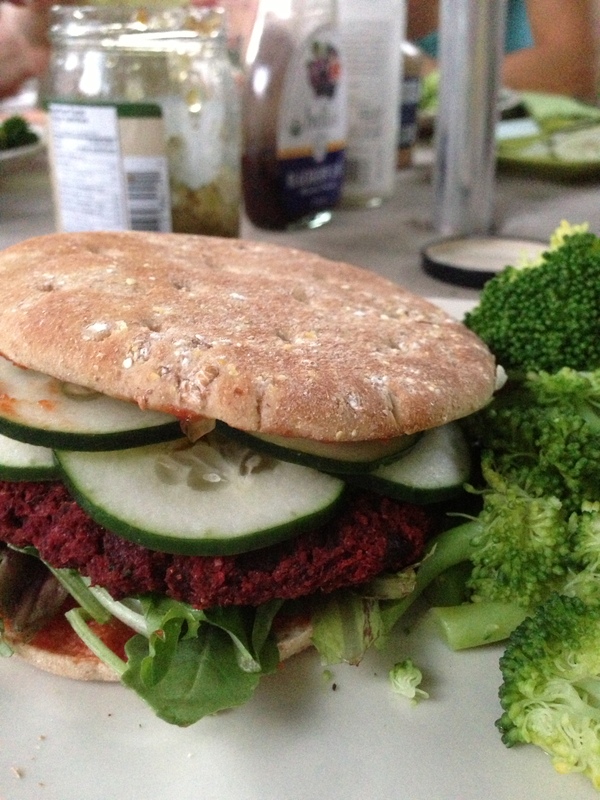 Thank you Carrie for inspiring me to get back in the kitchen after this crazy school rockslide, and thank you for creating an app with healthful recipes that we can actually use and feel good about eating!!! EDIT: This giveaway is now closed!!! Find out if you won here! I’ve been wanting to see what Journey Bars were all about for a while now, so I was so excited to have the chance to try them! 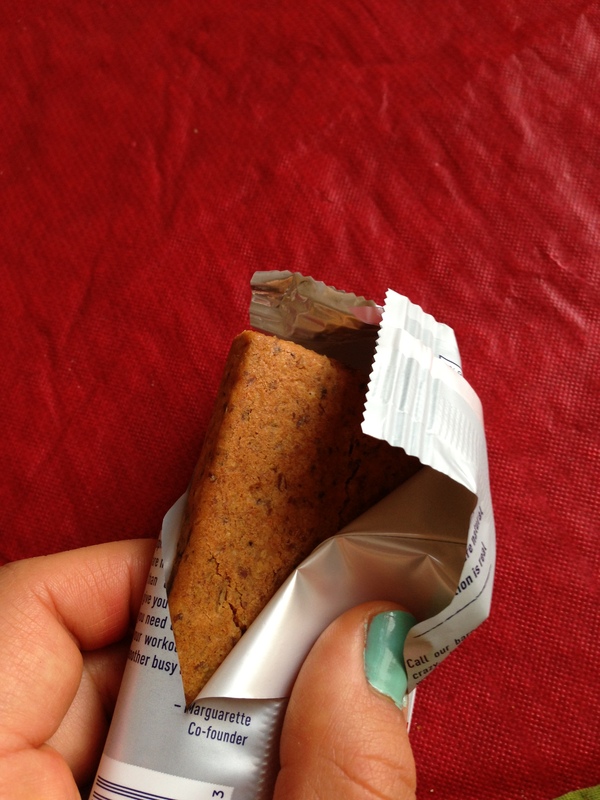 What are Journey Bars? They are savory nutrition bars packed with whole grains, almonds, and real herbs and spices that are all natural, gluten and soy free, vegan, and non-gmo (!!). Oh yeah, and did I mention they are so so delicious!! I noticed right away that this was no ordinary bar! 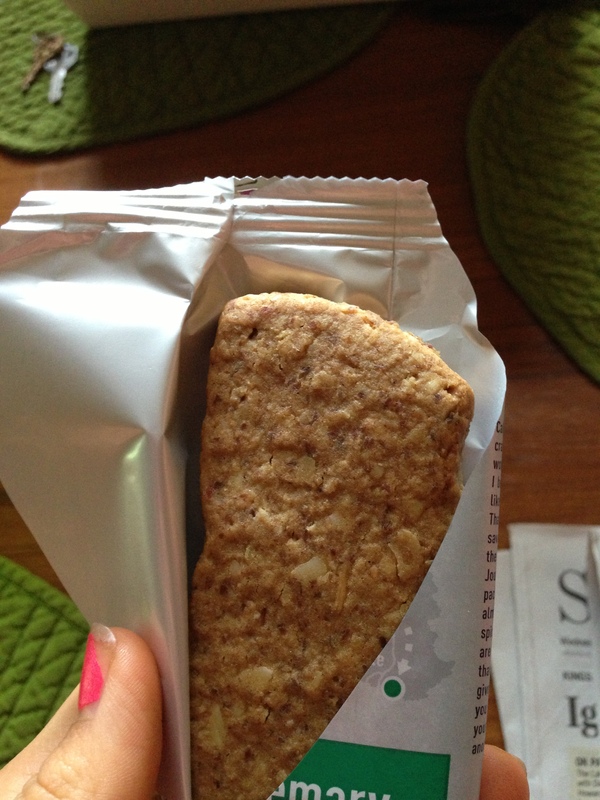 I opened the package and it reminded me of a dense bread or thick flatbread/muffin. 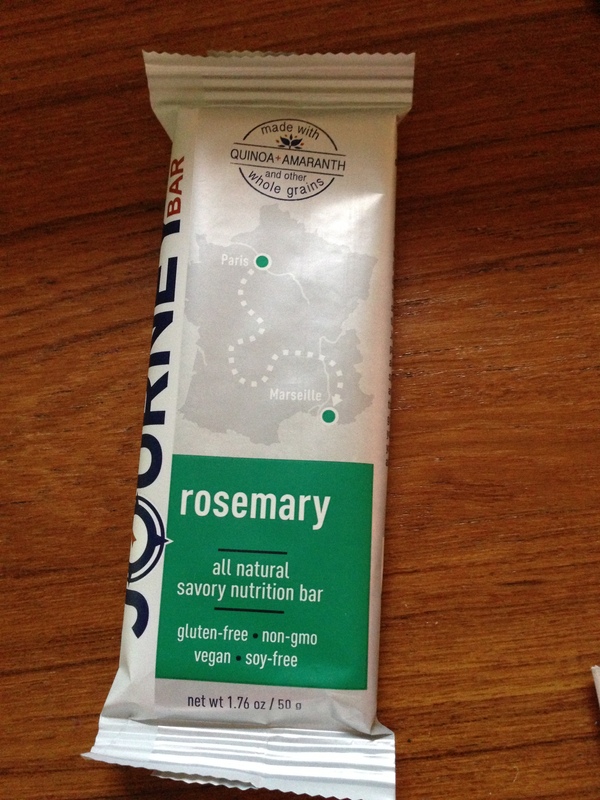 Just ripping open the wrapper I was hit with the scent of rosemary (which justsohappens to be my favorite herb) and this bar was so so good! Slightly sweet, mostly savory and packed with that lovely rosemary. mmm. just mmmm. this was also delicious! toasty from the sesame, a little freshness from the ginger (though it could have used a bit more ginger) and with that same tiny hit of sweetness as the rosemary. This bar was so different! I was a little nervous because-even though I LOVE curry-I am a spicy wimp and curry can get spicy, but this was perfect! Not too spicy, just perfectly Indian spiced and delicious! 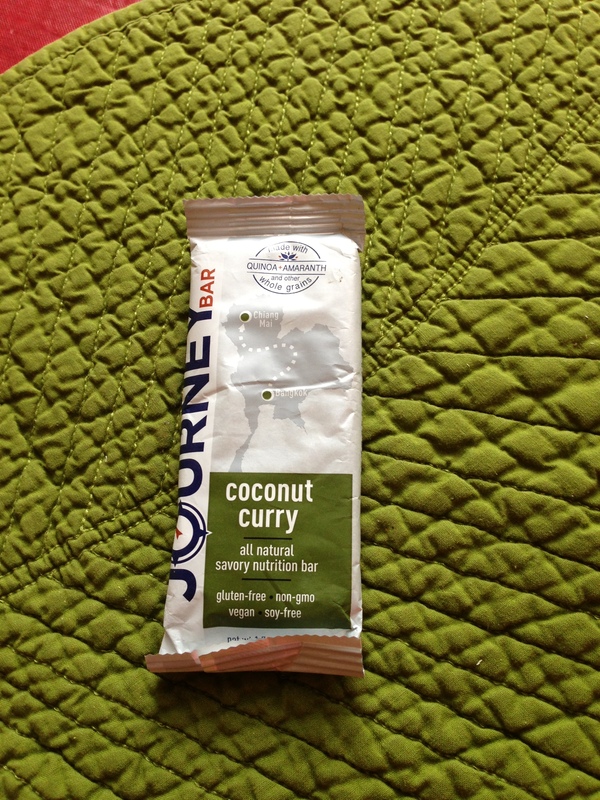 Also it was yellow, meaning it had turmeric (duh, curry powder haha), which I’ve heard is awesome for muscle recovery. I’d get this one again! And, last but not least I tasted the Pizza Marinara! This one did actually remind me of marinara! It was like a tomatoey version of the rosemary, and a great way to go if you are ever having a pizza sauce craving (that happened to me once…) and don’t want all the heavy cheese. Personally I still would go for the rosemary, but this one was still delicious. But wait? Wasn’t I sent 5 bars? Weeellll I couldn’t find the Sea Salt, and soon found out that my mom had eaten it while I was gone. Oops. She said “it was pretty good. savory and salty”. Hahaha! There is a good balance of fats, carbs, and protein for sustained energy/recovery without overdoing the sugar, plus its full of filling fiber (as much as a bowl of oatmeal!)! The only thing is that the sodium is a bit high, but considering that it is a savory bar I can’t argue with that! A bar that feels like a snack and not dessert, and doesn’t trigger a raging sweet tooth for the rest of the day – you feel satisfied after one of these unique bars! And as if Journey couldn’t get any better, they care about making a positive impact on the world! They support the national parks conservation association, and work to provide food, shelter, love and education to orphans in Haiti! Plus they are all non-gmo and non of them contain palm oil! It’s like the active activist’s dream bar! But wait -There’s more!! 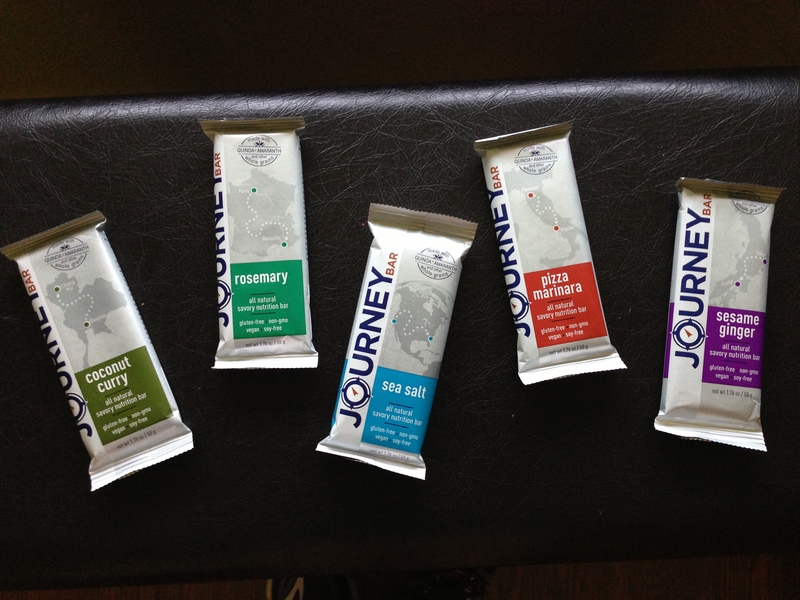 The lovely people at Journey bar wants to give one of you a sample pack with one of each flavor (thats 5 whole bars total!)!!! How awesome is that? 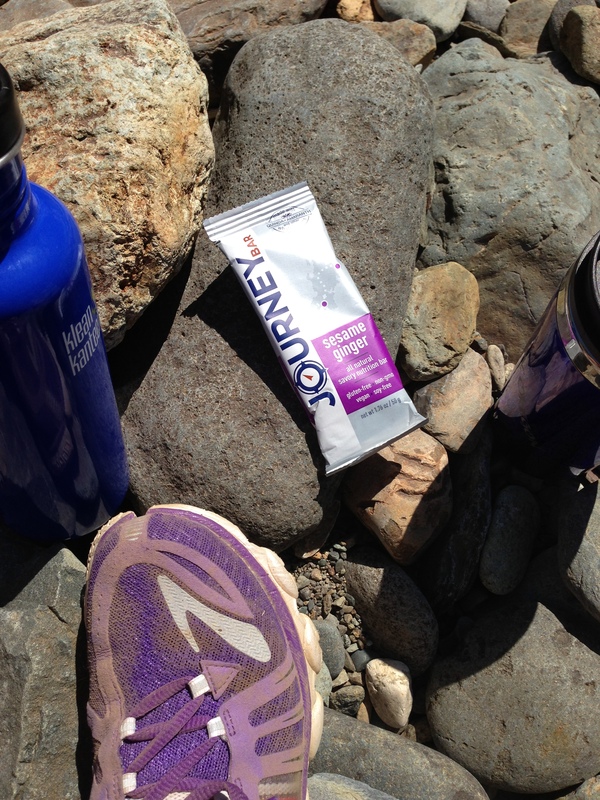 leave a comment telling me which Journey Bar you want to try most and what ‘journey’ you would take it on! 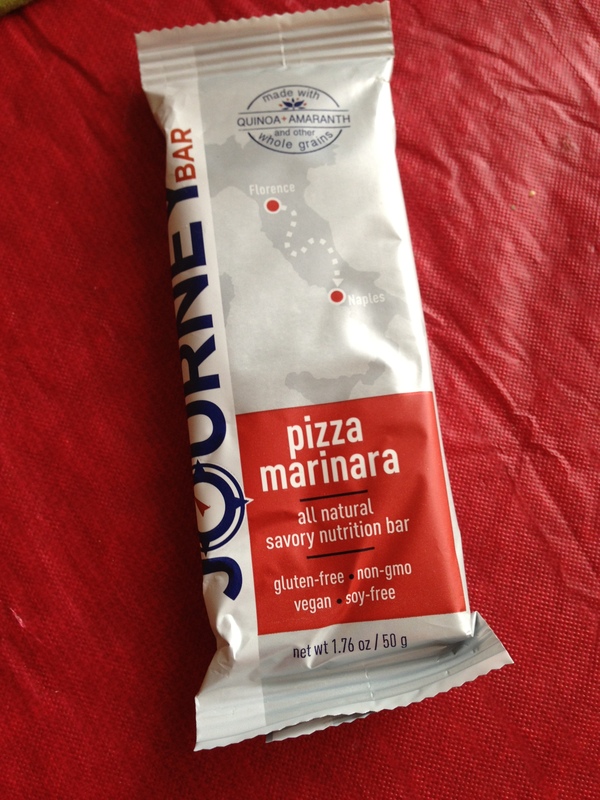 “like” Journey Bar on Facebook and follow them on Twitter, then leave a comment telling me you did so! “like” Life Hands You Limes on Facebook and leave a comment telling me so! I will randomly choose a winner next Wednesday (the 7th). Good luck everyone!